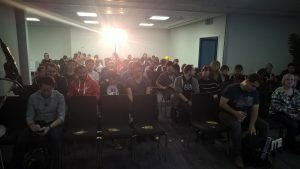 Team Centrifuge at EGX – ready to give the talk! 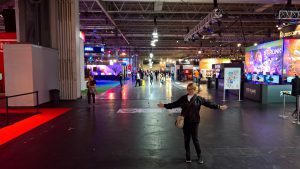 We recently went to EGX – the UK’s biggest games event and we had a very productive time! 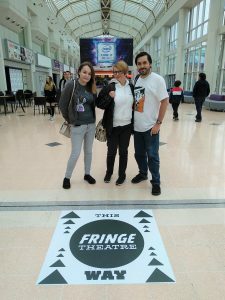 It wasn’t all fun and games as our team, consisting of Nathan and Berni – the company founders – and Sarah – who kindly volunteers as our community manager – gave a talk at the show. We were pretty pleased when it was accepted and we were given a slot on The Fringe stage at 2pm on the first day of the show. We didn’t expect many people to come as it was the first day and no-one really knows who we are. Imagine our surprise as we were setting up the AV for the presentation – the room started to fill up. Then a class of school children came in with their teachers and there was standing room only! We really enjoyed talking about our game development journey so far and framed the session as: Assumption followed by Reality then Advice. 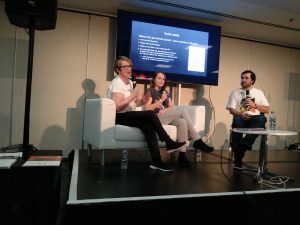 Nathan talked about the actual making of the game, Berni talked about social media, awards and PR and Sarah chatted about managing and engaging your community. The 45 minute slot flew by and we only had time for one question from the audience, although a few people stayed behind to talk to us afterwards. It was nice to see so many other game developers in the audience and the comments we were getting were that it was refreshing to hear a realistic and honest account of what it is like to start small and make games! We’re the only ones here! One good thing about having a slot on Thursday was that we then had the rest of the show to relax, play games and enjoy networking with other game makers and players. Well, that and the fact that we could get in early before the masses! If you’d like to see our talk then we’ll be editing it soon and throwing it up on YouTube. Will put the link in here soon! Previous Previous post: Interference is in Apps for Windows Ink!